Monday 4/22 – Moose - Healthy self esteem is the foundation for a healthy life, from the types of relationships we choose, to how we treat our bodies, and everything in between. And it’s not just about loving the parts of ourselves that we believe to be “good” or “acceptable”, but about embracing all of who we are, both the light and the shadow. What parts of yourself do you tend to hide away or minimize for fear of being rejected or judged? We make room for true acceptance and belonging when we share ourselves vulnerably, so be brave and let it hang out a little today. When you’re proud of the person you are, you won’t need anyone else to validate your worthiness. Tuesday 4/23 – Otter Reversed - Expressiveness. Creativity. Flow. Interdepence. Patience. Empathy. Receptivity. These are the gifts of the feminine and qualities that all of us, no matter how we identify, can celebrate and honor. Which of these gifts do you have room to cultivate within yourself and in your life? How can you honor these qualities in those around you? Where can you listen more deeply, without a need to fix or solve? Are there places you can soften and make more space for tenderness? In what relationships could you express your love more openly? These are questions worth sitting with today. Wednesday 4/24 – Snake - Life isn’t so much about what you’ve got as it is about what you do with what you’ve got. Our greatest struggles hold the possibility for the deepest healing, not only for yourself but for others as well. See if you can turn your problems or complaints into purpose today. Channel and release any difficult emotions into art, a passion project, or (a) movement. This will help you shift into a more empowered perspective at the very least and may even yield some unexpected solutions to the issues at hand. The key here is to ground any overwhelming energies first so that you’re taking action from a clear and aligned place. Thursday 4/25 – Beaver – If there’s something you’re wanting to build then you have to be willing to roll up your sleeves and do the work. You can have a magnificent vision, but without action, it’s only a wistful dream. If you’re struggling to motivate, maybe it’s time to ask yourself where you’re leaking energy. Are you participating in relationship dynamics that leave you drained or whiling away the hours aimlessly scrolling social media seeking a fulfillment that might be better found in more meaningful pursuits? No need to be hard on yourself, as perfectionism and self-criticism are also sneaky ways to avoid stepping into our purpose. Simply get clear about what you value most and let your choices reflect that. Friday 4/26 – Hawk Reversed – Both your environment and your body are speaking to you all the time. Are you listening? If you’re staying so busy that you never have a moment of stillness or you’re constantly projecting your fears onto the future, it can be challenging to connect with your intuition and the signs and synchronicities that are presenting themselves. Slow down. Breathe. Ground. Come back into your body so that you can be more available to receive intuitive messages. There’s no better source of guidance than your own vessel with all of its unique gifts and senses, so tune into it, listen closely, and then honor its wisdom. Saturday 4/27 – Dolphin – When you’re feeling disconnected, uncertain, or frazzled, you can always come back to your breath. It is the purest manifestation of life force, along with your tender beating heart, and both move in rhythm with all of nature. If you’re chest is tight and breathing deeply feels challenging, then you know it’s time to play, to connect with nature, and to engage in experiences that offer you an opportunity to bring your full presence to the moment at hand. Fill your heart up, so that you can remember what a gift this life truly is. Sunday 4/28 – Black Panther – There is so little in this life that we have any real control over and we have to choose whether we respond to that truth with anxiety and fear or with joy and trust. Which will you choose today? Can you embody the belief that life is happening for you instead of to you? Even if things don’t appear to be going your way? Life is so very full of surprises and unexpected gifts and even the most frustrating or painful detours often ultimately land us on the doorstep of something truly wonderful. Look for the lessons and growth in every circumstance that you’re handed and keep your heart open to the possibility of beauty and magic. Let go of how you thought things should be and you might just find yourself in a full embrace of what actually is. And be sure to Subscribe to the HelloAshleyBerry YouTube Channel to get notified when weekly forecast videos are posted! Monday 4/15 – Prairie Dog - Take some time out today and really nourish yourself in the most gentle ways possible. Avoid the tendency to fill up every minute of your free time with activities, no matter how many exciting or fun opportunities come your way. Truly deep restoration requires quiet, stillness, and space for yourself. It’s important to take time every once in a while to do a full reboot in order to keep all your systems running smoothly so, whether it’s for half an hour or the full day, go ahead and fully unplug. Tuesday 4/16 – Bear - The softer energies continue today and the messages coming forward are around dropping into a place of introspection. There may be a need to be present with parts of yourself that you don’t often tend to, either out of over-busyness or maybe even a little bit of fear. There is nothing inside of you that you cannot face. Connect with your heart center, take a deep breath, and then bravely meet the parts of yourself that are waiting to be seen, acknowledged, and loved up. Wednesday 4/17 – Raccoon - Don’t underestimate your ability to offer healing and support to those around you. The beauty in navigating challenging circumstances is being able to one day turn around and offer guidance and encouragement for others struggling with similar things. What have you come through? What have you conquered in your precious lifetime? Is there anyone around you who might benefit from the wisdom you’ve gleaned across these experiences? If so, be generous of spirit today and offer whatever support you can. Thursday 4/18 – Swan Reversed – Grace requires embodiment; there’s really no way around that. How can we move with ease and harmony if we are disconnected from our bodies, our hearts, or our spirits? Inhabit yourself fully. Drop into the truth of who you are and let that shine out of your every pore. Anyone who is repelled by your light was never meant for you and the ones that are meant for you will flock to your energy like a beacon. This goes for opportunities as well, so do your best to let go of any tendencies to try to be anything other than who you truly are, and let that clarity simplify your life in the most incredible ways. Friday 4/19 – Crow – In order to stand fully in our own light we have to be willing to embrace our own shadow as well, and the key to doing that effectively is first rooting deeply in compassion and self love. A little light-heartedness never hurts either. We can hold our challenges, our shortcomings, and the places where we still have lots of work to do with gentleness. In fact, to create true and deep healing, it’s absolutely necessary. Once you’re able to laugh, feel tenderness, and an opening to growth and expansion, rather than shame and contraction, you’ll know that you’re on your way to freedom. Saturday 4/20 – Armadillo – Life and our needs are ever-changing so our boundaries must be dynamic as well. What worked for you two years ago or last month or yesterday, may no longer work for you today. Check in. Are there places where you can be more flexible? Are there boundaries that you’re finding to be too soft? This process is just as much about the boundaries you set with yourself as it is about the boundaries you express to others. And the key word in that sentence is “express”. People aren’t mind-readers so if you want them to honor your needs, you must first make sure that you’ve been clear about what they are. Sunday 4/21 – Wolf Reversed – Don’t get sucked into the trap of thinking you have nothing left to learn or that no one else can offer you insights or wisdom. Absolutely everyone and everything can be your teacher if you only open yourself up to receive their unique perspectives and gifts. Children. Animals. Plants. Loved ones. Experiences. Even people and circumstances that we might wish desperately to be rid of hold a treasure. Don’t rob yourself of the opportunity to find it by remaining closed in your heart and/or mind. Live in a state of curiosity and you’ll find that there’s something new to learn absolutely every single day. Monday 3/25 – Hummingbird Reversed – Joy is magnetic and choosing to live within that frequency is one of the most empowering shifts we can make. Regardless of our circumstances we can always decide to orient towards gratitude, wonder, and awe. This doesn’t mean slapping on a fake smile when we’re sad or struggling, but rather maintaining a perspective of curiosity, an openness to the possibility that everything is happening for, instead of to, us, and a willingness to seek out the beauty in absolutely every experience. Yes, life can have its fair share of challenges and heaviness, but it’s up to each of us to decide how we carry the load. Make things easier on yourself today by releasing the weight of bitterness and fear and allow the spaces left behind to be filled with love and the simplest pleasures, which are the truest forms of nourishment we can ever have in this life. Tuesday 3/26 – Skunk Reversed - Relationships can be some of the most powerful mirrors in our lives and often reflect the ways that we show up in the world. If you’ve been repeatedly finding yourself tangled up in interpersonal dynamics that don’t feel good to you, it might be a good time to ask yourself where your responsibility in that is. While we can’t control other people’s behavior, we are constantly sending out messages, consciously and not, about what we have to offer and what we are willing to accept, and this plays a big role in the types of relationships we find ourselves in. If you don’t like what’s been showing up for you, take some time to reflect on what you’ve been putting out in the world and make the necessary adjustments so that you can call in the connections and experiences that you actually desire. Wednesday 3/27 – Badger – There’s a time and a place for everything and today it’s time to tap into and harness those aggressive energies that may have been bubbling under the surface for a while. Channel them into any projects or ventures that seem to have stalled out during the retrograde season that just ended and don’t be afraid to go after what you want with intensity. Just be sure that you are grounding with lots of self care and proper down time to avoid getting burned out or falling into the trap of tunnel vision. And don’t forget to check in regularly to make sure that your actions are aligned with your values so that anything you create is built on a foundation of integrity. Thursday 3/28 – Spider – Your entire life is a masterpiece that you create moment by moment, and when you’re intentional about what it is you’re creating, you have the opportunity to make it something that is healing, both for you and for the world. What kind of legacy do you want to leave behind when you take your last breath? What impact do you wish to have on people and the world around you? Allow the answer to those questions infuse each breath, each word you speak or write, how and where you spend your time and energy, and the way in which you move through the world. Friday 3/29 – Weasel – Sometimes when we encounter challenging circumstances, it can be incredibly helpful to consider different perspectives. There’s multiple sides to every story, conflict, and situation. Being able to at least consider each side allows us to have a more dynamic understanding of what is in front of us, and therefore a more informed, creative, and nuanced approach to addressing it. Brining a playful attitude to this sort of investigation and keeping it centered in tenderness and curiosity will also ensure that we don’t fall into manipulation, which has a tendency to backfire and yield undesired results anyway. The goal here is to try to figure out how to work with what we’ve got in the most constructive way. Saturday 3/30 – Mouse – Take a little time today to really focus in on the details. Take inventory of the various areas of your life and really ask yourself what is in alignment and what is not. Make sure that all of your systems, both internally and externally, are functioning at their most optimal and if they’re not, start the work of figuring out what needs to shift so that you can create the conditions for the most vibrant, healthy, and joyful life you can possibly live. This may involve letting go of things, habits, relationships, and circumstances that no longer serve your vision of your best life. Do what you need to do to gain closure, so that you can move forward in a way that is more fully aligned with your highest self. Sunday 3/31 – Opossum – If you feel like you’ve been backed into a corner in some part of your life, rather than trying to fight your way out, you might consider just “playing dead” for a bit. Disengage from the conflict and give the entire issue some breathing room. You might find that it resolves on its own without you having to expend unnecessary energy trying to defend yourself. If there’s someone in your orbit who seems to be trying to get a reaction out of you, whatever you do, don’t take the bait. You’ll be able to stay much more conscious and intentional about your own choices when you don’t allow others to manipulate you into playing a game where the odds are already stacked against you. Keep your power by remaining neutral and centered. Even if the issue doesn’t completely dissolve on its own, a little space might help some of the charge around it settle down so that you can re-engage from a place of calm and grounded awareness. 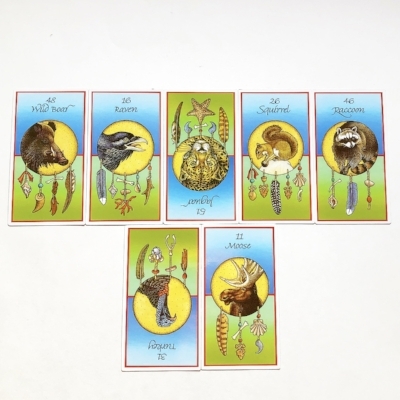 Monday 3/4 – Coyote – Some say that the ones who we find most challenging to connect with are our greatest teachers, and today we are being called to embrace this possibility. If you find that there is someone in your sphere who seems to be testing you, pushing against your boundaries, or stirring up some tension for you internally, take a deep breath and then ask yourself what you can learn from this situation. Are parts of your own shadow being triggered? Have you been taking yourself too seriously? Is there room to be more flexible and forgiving with others? Once you’re able to view the dynamic from this perspective, you may find that there is less charge around it, that you are able to engage with much more ease, and you may even walk away with some powerful insights about yourself. Tuesday 3/5 – Dog - All relationships involve some degree of exchange, and in order for a connection to be a healthy one, it’s important that the exchange is circular. This doesn’t mean that you have to be even-steven on everything or keep a tally of who does what for whom, but it is important to keep the energy flowing and one way of doing that is to offer support to the ones who have done so for you. Take some time today to give back, in whatever way you can, and don’t be afraid to think outside of the box. Taking someone out for lunch is lovely, but maybe they’d be just as happy to receive some word-of-mouth support for a venture they’re trying to get off the ground, help with a home renovation task, or even just a safe place to sound off on some things that they’ve been struggling with. If you’re not sure how best to support them, ask. A little generosity of spirit can go a long way towards strengthening a connection. Wednesday 3/6 – Lynx – “If you see something, say something” doesn’t apply when it comes to making commentary on other people’s lives and personal choices. For empaths and intuitives, this can be especially tricky as it can be oh so tempting to call people out on things that they may be trying to hide from others or even from themselves. In general, people confront the truth when they are ready and not a moment sooner so exercise some restraint today and hold your tongue. Particularly with Mercury in retrograde, even well-intentioned statements can come out the wrong way and cause more harm than good. If you really need to get it off your chest, write a letter to the person you’d like to have words with, burn it, and then send them prayers. They’ll receive the benefit of your energetic support much more than they would your attempts to guide them. Thursday 3/7 – Armadillo – Healthy boundaries make for healthy relationships and the medicine coming forward today is all about checking in on what that looks like for you. What are your bottom lines and what are you absolutely not willing to tolerate? What do you need to feel safe, secure, and loved? And this doesn’t only apply to your relationships with others. Setting boundaries with yourself and being consistent about honoring them is foundational for your ability to do so with others. Are you able to make and keep commitments to yourself? If not, how can you expect others to show up in that way for you? Work from the inside out to create the conditions that support you in being the very best version of yourself. As you treat yourself more lovingly, you’ll notice that others follow suit and that you’ll be more able to lovingly release the ones who don’t. Friday 3/8 – Crow – Watch out today for the tendency to think in absolutes about what is right and wrong. Sure, there are some universal codes of morality that most of us can agree on, but most of our day-to-day interactions and choices fall within a multitude of shades of grey. Our moralities can’t be constructed inside of a vacuum and should instead be informed by the many layers of context present in any given circumstance. If you find yourself clinging to judgment and feeling compelled to point a finger at another, it might be an indicator that you hold similar qualities in your shadow and have room to do some internal work around that particular issue. Focus on healing your own wounds and lead by example rather than by proselytizing. Saturday 3/9 – Raccoon – Empowered people empower people and today may present you with an opportunity to do just that. If you see someone around you who seems to be struggling and feeling like the underdog, lend a little bit of your strength to them in the form of encouraging words, sharing from the overflow in areas where you’re feeling abundant, or offering some other form of support. Just make sure that you’re helping that person to tap into their own power rather than simply swooping in and saving the day, otherwise you may actually end up feeding into their sense of being a victim and creating a sense of dependence on you. Sunday 3/10 – Beaver – Invest in the things you wish to build today. If you have any projects or ventures that are especially important to you, get a head start on your workload. With Mercury retrograde in play, things may take a little longer than expected and tech could end up being a little glitchy so you may really thank yourself in the week ahead for starting early. Also, be sure to back up all of your tech devices regularly. An ounce of prevention is worth a pound of cure as they say, so protect your work by making sure it’s stored! This should have you starting off the new week tomorrow feeling more grounded and with a bit more breathing room should anything unexpected come up. Monday 7/30 - Wild Boar is all about radical honesty and confronting the truth with wide open eyes. This may mean looking your own demons in the eyes and calling them by name or it could also indicate that it’s time to speak your truth to someone in your life. If there’s something that needs to be said, but the other party is not available for a heartfelt discussion, either physically or emotionally, perhaps write a letter airing all of the thoughts and feelings that you have been holding and burn it to release the energy. Tuesday 7/31 - When Raven swoops into your cards there’s bound to be magic afoot. You may notice patterns of synchronicity presenting themselves today or find that your intuitive abilities or state of consciousness is heightened today. This is an especially good day for intention setting, energy work, or taking extra time to connect deeply with Spirit. Wednesday 8/1 - Jaguar Reversed indicates that it might be time to take a little inventory of how your actions are aligning with your values. Are there places where your integrity has been compromised? In the work you do? In how you’re showing up in relationships? In how you treat yourself? If so, acknowledge the issue, offer yourself some compassion and forgiveness, and do your best to bring your mind, body, and spirit back into true alignment. Thursday 8/2 - Squirrel Medicine is all about gathering, preparation, and planning ahead. What can you do now to make your life a little easier for the upcoming weeks ahead. This could mean saving your energy or resources up in anticipation of a period of high output or doing a little bit of cleaning and streamlining in your inner and outer spaces so that you can meet life and any shifts that are headed your way with groundedness and clarity. Either way, a little work to prepare yourself for what’s ahead can go a long way today! Friday 8/3 - While Raccoon may look like a little bandit, it happens to have a very strong natural tendency to be a protector and a provider for others, particularly for those who may be less fortunate. Are there people in your life who may need a little support? How might you be able to tap into your own sense of generosity? Are there places in your life where your cup is overflowing and you have the ability to share? These are the questions to ask yourself today. Saturday 8/4 - It is certainly always interesting to see Turkey Reversed follow Raccoon as the turkey is all about generosity and the idea of “give away” and when it shows up in the reversed position, it usually means that there is some challenge around scarcity mindset and an inability to trust that there is enough for all. If you notice these feelings coming up today, ask yourself where the story is coming from. If you need support shifting this mindset, spending time in a gratitude practice can be a very powerful way to connect with the abundance in your own life. Sunday 8/5 - Moose medicine is in order on this day which means it’s time to acknowledge your recent successes and allow yourself to be filled up with the joy and pride of your own accomplishments. In our achievement oriented society, it’s so easy to complete one thing and be on to the next before we’ve even had a chance to celebrate the milestone. But taking stock of where we’ve come and what we’ve learned along the way helps hone our wisdom as well as our sense of self worth, so today, take some time to love yourself up for all that you do.